October 13th is the last day to register to vote in the November 3, 2015 state elections. If you are new to Virginia, have moved within the State or City, or have never voted before, you can register on-line at www.elections.virginia.gov. At the website, you can also find your polling place and see a sample ballot. You can also register through the Norfolk General Registrar in City Hall. Call the Registrar’s office for further information on how to register at 757-664-4353. Voter registration forms are usually available at libraries and Department of Motor Vehicle offices. Polls will be open November 3, 2015, 6:00 am until 7:00 pm. Voters who are disable, age 65 or older, or pregnant may vote in their car if brought by an assistant. Voters must present a valid picture identification card. Acceptable forms are a valid Virginia driver’s license, a Department of Motor Vehicles-issued photo ID card, a U.S. passport, other government-issued photo ID card, and college or university student photo ID card issued by an institution of higher education located in Virginia. 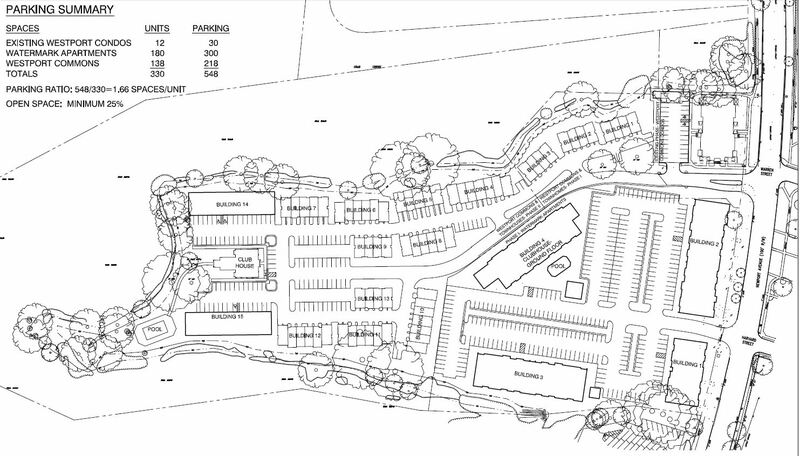 Kotarides Development expects to close in mid-late September on the purchase of the 10+ acre property where Kroger/Workforce Development Center is located. No plans for future redevelopment have been announced. Both Kroger and the City have leases that Kotarides plans to honor. Sam’s Club has a tentative opening date of November 5. The parcel behind Wendy’s is available for redevelopment. The City has two new business loan programs of up to $50,000 for small to medium businesses. The Citywide Partnership Fund will provide loans to new and expanding businesses to stimulate economic development and private investment that will create permanent employment opportunities for low to moderate income residents. The Global Initiatives Fund is a first of its kind program to support local exporters. For more information, contact Leslie Osborn, Chief Credit Officer, at 757-664-4333 orleslie.osborn@norfolk.gov. Denby Park – James Rogers, Director of Neighborhood Development, reported that the latest group of apartments has been torn down and the City will maintain the area in grass. Mr. Rogers said that the City will host a charrette with citizen groups to discuss the future of the area. A tentative date was set on October 19, 5:00 – 7:30 pm, location to be determined. It was suggested that the City invite all civic league presidents and include a link to the 2004 development study of the Wards Corner area commissioned by the City. Parking on the grass along West Little Creek Road is still occurring and expanding. The proposed ordinance change that was discussed by the task force in May was approved by the Planning Commission but has not been placed on the City Council agenda. The medians along Granby Street where Virginia Natural Gas conducted gas line replacement have still not been repaired – the irrigation system and plantings have not been replaced. Public Works will look into this. A concern was raised that the medians along Thole Street and throughout the City have not been maintained due to lack of staffing in the Department of Recreation, Parks and Open Space. Council reps said the City is considering contracting out the landscaping maintenance of public spaces. Councilwoman Whibley requested that Darrell Crittendon, director of that department, be asked to speak to the task force at the next meeting. School Board rep Brad Robinson said that a new superintendent of schools will be selected by November 1. Alyce Kalfus, Wards Corner Business Association, announced that there will be a large family-friendly event at Ward’s Corner called “Ward’s Corner Salutes Our Military” on Saturday, September 19, 10AM – 7PM. Food, entertainment, prizes and giveaways, military discounts, and more will be part of the fun. Next meeting will be November 12, 2015, 8:30 am at the Norfolk Fitness and Wellness Center. Art Collins and his development company are almost complete with the demolition of the old Riverside Terrace apartments on Newport Ave. He is replacing the old apartments with a mixture of apartments, townhouses, and condos. The Watermark Apartments are currently under construction on Newport Ave and the designs were approved some months ago with significant civic league involvement. Collins is now moving forward with the design and construction of the first three townhouse buildings. As a requirement of the zoning, the design and architecture of these buildings must be reviewed by the Architectural Review Board and the Norfolk Planning Commission. 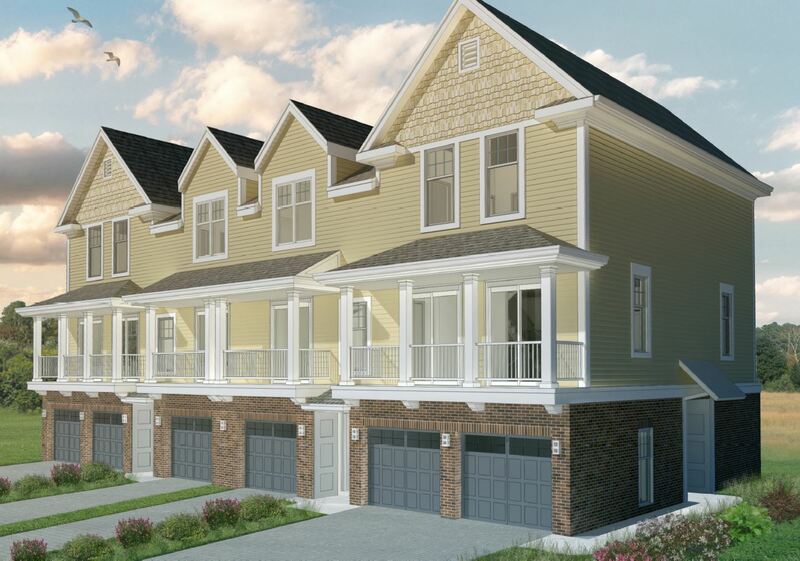 On September 3, 2015 the Norfolk Architectural Review Board reviewed the plans and architecture of the first three townhouse buildings to be built at Westport Commons. They recommended approval of the designs with a condition that the windows be double hung rather than single hung. The Planning Commission will review the designs on September 8, 2015. Front elevation of the proposed townhouses. The exterior materials are mostly brick and fiber cement. No vinyl siding is proposed or allowed. 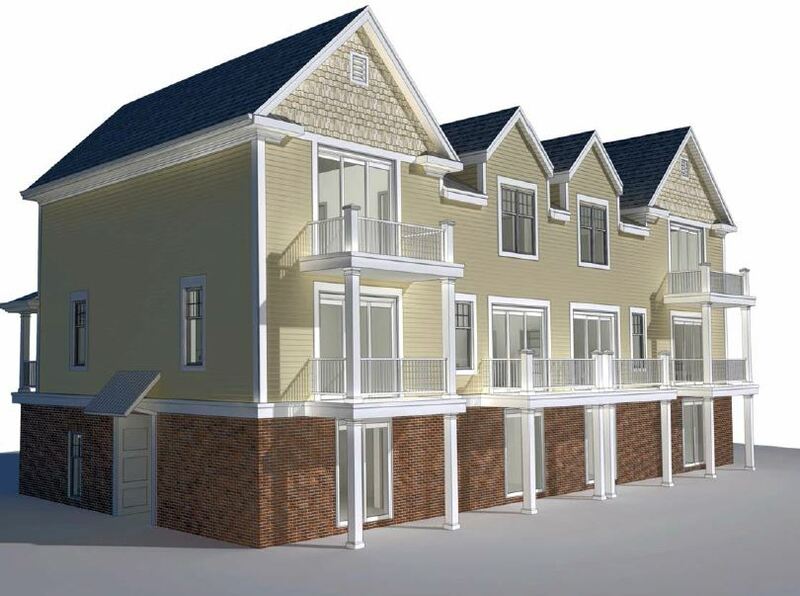 Rear elevation of the proposed Westport Commons Townhouses. 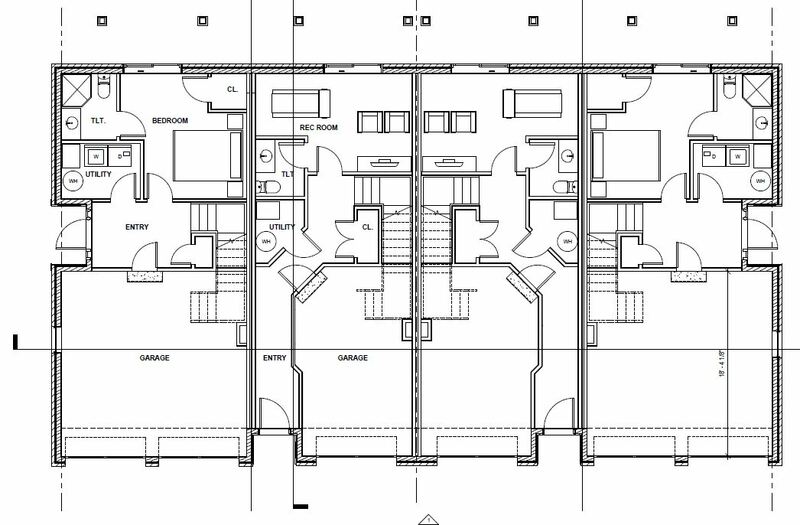 First floor plan of the proposed Westport Commons Townhomes. 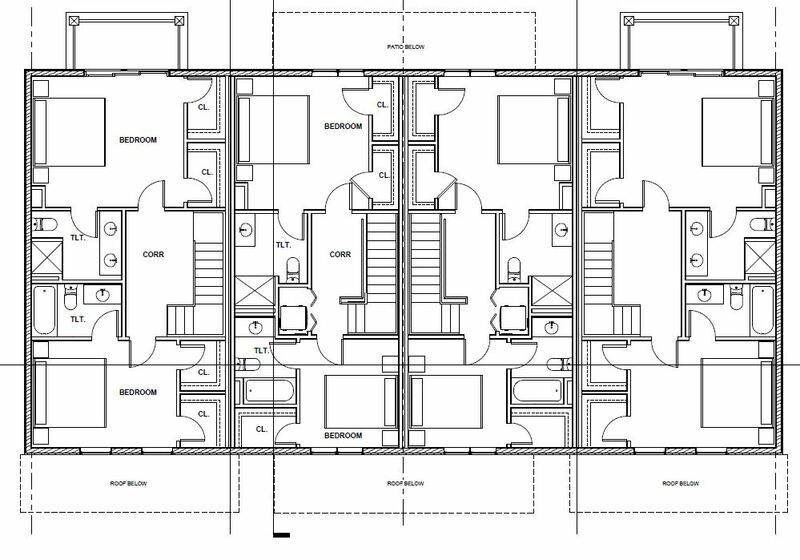 Second floor plan of the proposed Westport Commons Townhomes. 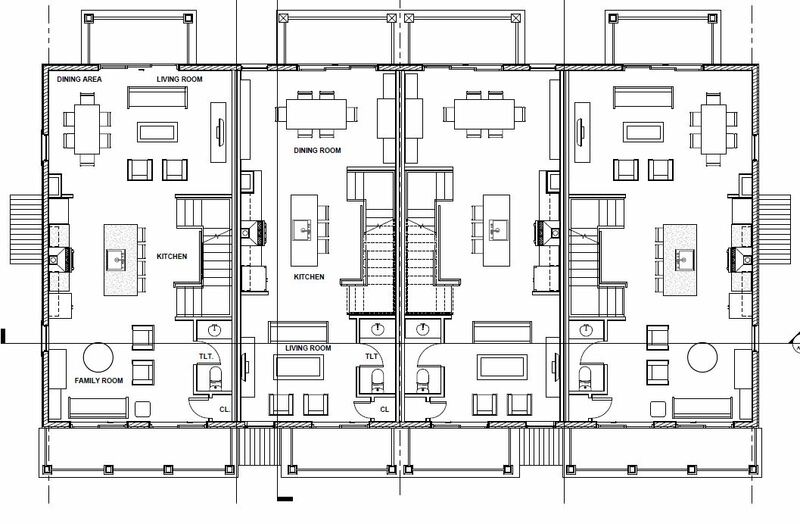 Third floor plan of the proposed Westport Commons Townhomes. Park Place at City Center at Oyster Point is a mixed used development by Kotarides Developers. Something similar could come to Wards Corner. Kotarides Developers is set to close on the purchase of the Kroger anchored shopping center at Wards Corner. The purchase includes approximately 10 acres of land where the Kroger grocery store and the City of Norfolk’s Workforce Development Center are currently located. The purchase does not include any of the out-parcels. The current shopping center was developed in 1971 and has 105,471 of total building area. Kotarides indicates that they have no firm plans for the property at this time. 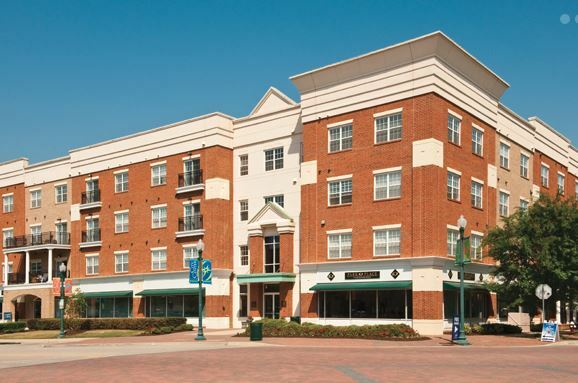 Both Kroger and the City of Norfolk have multi-year leases. Their options include continuing the current use by Kroger and the City, re-using the current retail buildings, constructing brand new retail buildings, or a mixed use concept with both retail and residential. Kotarides did state that they have no plans to put in low income housing. None of their current projects include low income housing and they have no desire to begin doing low income housing projects. According to tax records the property is currently owned by Meritage-Little Creek, Llc. The closing on the sale of the property is scheduled for the middle of September. You are currently browsing the Wards Corner Now - Wards Corner, Norfolk, Virginia blog archives for September, 2015.